Some conflicts may be justified, but there are undoubtedly some campaigns, some battles and skirmishes, which appear to have been completely pointless. No doubt the politicians and strategists who devised them had a justification at the time, but events tend to suggest otherwise, as a sense of futile helplessness pervades what happened. 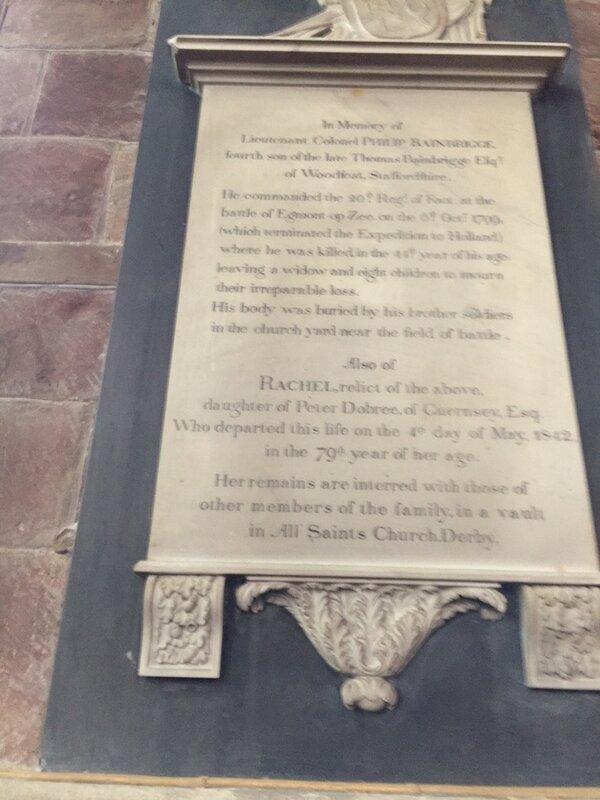 Such a one was the campaign that led to the monument for Lieutenant-Colonel Philip Bainbrigge in the mediaeval parish church of St. Oswald’s in Ashbourne, Derbyshire. To be fair there were objectives behind the Anglo-Russian invasion of North Holland in August, 1799, so it was not literally pointless. In 1795 the Dutch had rebelled against the Stadtholder, William V, Prince of Orange-Nassau, and the Batavian Republic had been established. It was a genuinely popular revolt, but it was also supported, militarily as well as morally, by the French. The monarchies of Europe, however, believed that there was considerable support for William still latent in Holland, and that an invasion could draw in that support and so overthrow the Republic. Moreover, there was concern in Britain that the Dutch fleet, being strengthened under the Republic, could be used by the French to support an invasion of Britain. The destruction of the Dutch fleet would be a desirable outcome. The campaign began in earnest in late August. On the 27th thirty-two thousand British and Russian troops landed near Callantsoog in North Holland, which is the peninsula that protrudes north of Amsterdam, separating the North Sea and the Ijsselmeer. The invasion was not a surprise, and the landing was opposed, but nevertheless succeeded, with the coalition forces victorious at what is known as the Battle of Callantsoog (also known as the Battle of Groot Keeten – the two are adjacent villages). The invasion went well. Three days later the Dutch fleet, stationed at Den Helder at the tip of the peninsula, was taken by Admiral Sir Charles Mitchell. On the 10th September the coalition forces under Sir Ralph Abercromby met and defeated a Dutch-French army, under the command of the French general Guillaume Brune, at Krabbendam (also called the Battle of Zijpedijk). This was a significant action for our Philip Bainbrigge. The 20th Foot, consisting of two battalions under Lieutenant-Colonel Smyth and Major Ross, played a major part in the capture of the village, driving the French troops out, but as they did so both Smyth and Ross were injured, and Bainbrigge took command of the 1st Battalion. Although the Ashbourne memorial says he was a Lieutenant-Colonel, he actually held the post of Major in the regiment, although he had been accorded Brevet Lieutenant-Colonel status in January, 1798, whilst with the Liverpool Regiment. Five days after Krabbendam the commander of the army finally arrived to take command; it would be interesting to know what the so-far-successful Abercromby thought about the army now being led by His Royal Highness Prince Frederick, Duke of York, second son of the King, George III. Perhaps he thanked Heaven, as the army would now become plagued by mishaps. The weather turned, and rain fell consistently. As a result the already poor road system in North Holland deteriorated further, and supplies from Den Helder failed to reach the troops. To forestall enemy foraging the Dutch flooded farmland, removing food sources and further damaging the infrastructure. The coalition troops, marooned in low-lying swampy country, began to die from disease. The bad luck, or poor planning and logistics, was to feature in the next major confrontation of the campaign, the Battle of Bergen on September 19th. Frederick’s army was in four columns, with Abercromby in charge of the left column, which included Bainbrigge’s 20th Foot. Abercromby's forces, however, found themselves bogged down in the bad weather and the bad roads, and failed to make the expected progress, and therefore failed to engage the enemy when planned. In contrast the Russians in the centre took the village of Bergen at 8 a.m., far earlier than planned and thus lacking any British support. Apparently the commanders had failed to synchronise clocks. The Russians were therefore forced to withdraw, and the coalition assault deemed unsuccessful. The Republican forces were given the opportunity to realign and secure the routes to Amsterdam which the coalition had been hoping to control. The 2nd of October saw the 2nd Battle of Bergen, also known as the Battle of Alkmaar. The coalition troops were successful in capturing the town of Alkmaar, and thus securing the northern half of the peninsula, but were now already being plagued by the problems mentioned above, all of which were to get progressively worse. Realising his difficulties Frederick resolved to press on and attack Brune’s forces at Castricum, south of Alkmaar. After a day of fighting the right and central columns were eventually driven back in disarray, so chaotic that two field hospitals with their wounded, and four hundred women and children, soldiers’ families, were allegedly forgotten about in the retreat. Abercromby’s left column fought to a stalemate in a separate battle on the beach and dunes, and it was somewhere in this engagement that Philip Bainbrigge of Ashbourne, forty-three year-old father of seven, lost his life. At the beginning of this account I said that this campaign appears to be one of those that could be considered pointless. Despite their previous victories, despite the occupation of Alkmaar and most of North Holland, the defeat at Castricum prompted Frederick to make the decision to retreat to his original bridgehead, thus losing all the territory gained since September. Within a few weeks a lot of men had lost their lives for what looks like nothing, and Frederick, short of supplies, with bad weather making replenishment by sea unreliable, was suing for peace. It looks clearly like a futile adventure. However, there were two positive outcomes. One was that the capture of the Dutch fleet meant that the Batavian Government had lost over a third of their ships, much reducing its effectiveness as a threat to Britain and its navy. The second was that the logistical problems that had befallen him led Frederick, as Commander-in-Chief of the British Army, to instigate reforms within that institution that were aimed at improving its efficiency, including the creation of Sandhurst for officer training in 1801. His exploits as commander also gave us a nursery rhyme - "The Grand Old Duke of York". All a bit too late for Philip Bainbrigge, although his line lived on through his seven children, two of whom, John and Philip, attained the rank of Lieutenant-General (a tablet to Philip's son Edward, who died at Sebastopol, is also in St. Oswald's). The wife of Julian Fellowes, of Gosford Park and Downton Abbey (and, of course, Monarch of the Glen) fame, is our Philip’s 4 x great-granddaughter. Ironically, in the television version of 'Sharpe's Regiment' Fellowes plays the part of The Prince Regent, brother of that Duke of York who had sent his wife's ancestor to his death. leaving a widow and eight children to mourne their irreparable loss. His body was buried by his brother soldiers in the churchyard near the field of battle.